Barton offers an easy and innovative solution for installing solar panels to existing or new roofs with the use of the Latchways Solar Panel Support Post™. 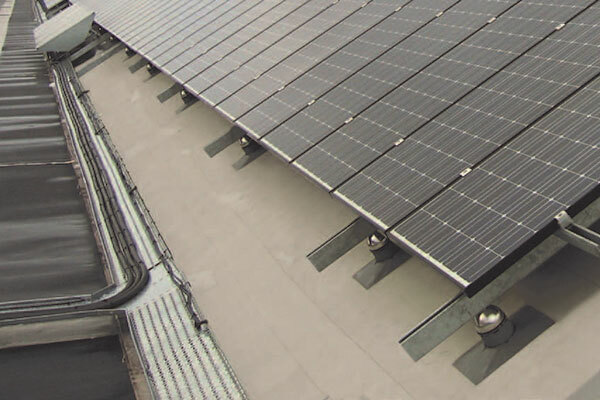 The Latchways Solar Panel Support Post™ enables the solar panels to be ‘top fixed’ to the complete roofing system. Thus, there is no need to attach the support post through the roof to the building structure. It is the ideal solution when fitting solar panels to an existing roof. On warm flat membrane roofs, the use of concrete weights is negated. Such weights impede drainage, cause localised ponding of water and over compress the supporting insulation. Furthermore, membrane manufacturers will generally require the use of an additional isolation layer between the weight and the membrane, thus adding cost to the final installation. Each Solar Panel Support Post™ is capable of resisting a tensile, shear and imposed load of 2.5kN maximum. It incorporates the unique Latchways Overload™ feature that assists the protection of the finished roof in the event of excessive up lift. This feature can also provide a visual indication that remedial action may be required. Barton can provide solutions for over 400 different roofing systems thanks to the 70 variations of the Latchways Solar Panel Support Post™.